This second children’s book of poetry by Milne is actually my favorite. If I were to pick one of the two he wrote, I’d pick this one. Most of the poems are much longer, and therefore give the reader something to follow, whereas in the earlier children’s book, When We Were Very Young, they are short, one-page poems. For the children up to age 8, especially if they are reading on their own, this one may be more satisfying. I love the imagination in this collection, and the way it lets us be in the mind of the child. And yet, in a very light-handed way, some of the poems also have a hint of a little moral lesson…nothing heavy handed, but just enough for putting a seed in a young person’s head. This is definitely both a read-aloud book for younger children, and a great book for practicing reading for emerging readers up to age 8. Along with When We Were Very Young, the book makes a nice introduction to the joy of language, poetry, and playfulness. Part of learning to read is that children learn to recognize sounds that ‘go together.’ Reading poetry such as we find in this book help develop the ear needed for reading. Reading skills are also enhanced by developing memory, so some of these poems might be learned by heart. The World of Christopher Robin contains both books of poetry. 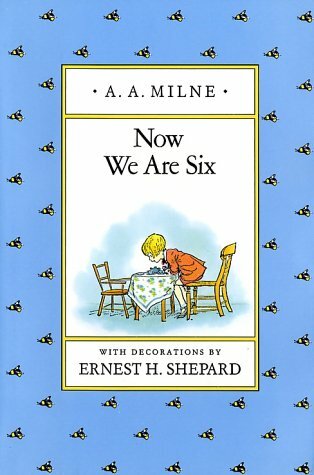 However, the children’s book Now We Are Six can also be gotten on it’s own. I’d stay away from any Disney versions of the book, and look for versions that have the original drawings, as they capture the real feeling in this unique book.